This might just be the last post of it's kind! Our lives are changing and, along with it, our blog. 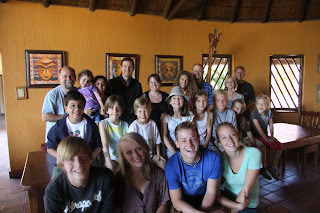 We are moving out of our house and finishing up our second term in Mozambique. Nine years of ministry here! We'll still be around for a few things through the month of May, then will be moving into a time of rest in June and then into our home assignment time. We've just enjoyed a jam packed month with our boys home for school break. During that one month, MozOvos hosted a citywide soccer tournament. The purpose was for the churches involved to get unbelieving boys in their community on the team with believing young men so that relationships could grow into transformed lives for God. Helping us make all this happen was a team from the United States and South AFrica. One of our supporting churches, Lakeside Church in Folsom and a church from Pretoria joined together and were AMAZING at stepping in and doing whatever was asked of them. All in all, everyone was thrilled with how it went. The following day, we left with Andrew and Stephen and two of young women from Lakeside Church to prepare for our Worldventure Mozambique Field Conference in South Africa. We did loads of food shopping, cutting and preparing food for our team of 21 to come together for a time of prayer, worship, business and being together. We then had one day at home and left with our boys and the same two young women for Mozambique Island, our new home. It would be the first time for both boys to see our house there and the final time for us to visit until we move there in 2013. We spent 61 hours in the car coming and going(3 days there and 3 days back)! Mozambique is a huge country! In the near future, we'll be posting Maputo goodbyes, graduation photos and then will transition this blog into a blog about our excursions in the States. It is so encouraging to see and hear what God is doing in Choupal. I miss you guys greatly and seeing pictures doesn't help that one bit. I'm praying for you as changes are coming in many ways, shapes, and forms. I love you all dearly! บาคาร่า The site is open to the side of the game, betting on the Internet. That is the number one in Siam that it is. Because of the work that has been around for more than 8 years from its establishment in the Manx Islands of Europe. I received a permit to open. Online Casino Betting It is the first law.